Without a doubt, pocket knives are one of the most useful tools for anyone to carry. When in good condition and sharpened correctly, a pocket knife will save the user time and effort. Dull blades simply don’t cut it; they can cause injuries and frustration, resulting in a job that takes longer than it should to complete. 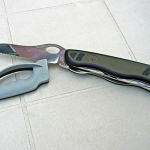 By comparison, a sharp blade means expending less energy to perform the same task, whether that’s opening cans or boxes, whittling wood, scoring objects to break more easily, or simply cutting up your food over a campfire. Sharper blades are also safer because they won’t slip as much and require less pressure to use in the performance of a task. In a sense, your pocket knife is only as good as the sharpness of its blade, so knowing how to keep it sharp is essential. Methods for sharpening objects date back to the dawn of civilization when people figured out they could use one stone to sharpen another, thus creating arrowheads or blades for a variety of uses. Over time, blade sharpening techniques have been refined and there are literally dozens out there to choose from. The following two methods are as easily used by beginners as experts. If you want a sharp blade but don’t want to have to worry about using the exact right angles and techniques, you can use a knife sharpener that automatically aligns the blade correctly, making the process much easier. You can find our picks for the best knife sharpener here. The stone method is one of the most common ways to sharpen a knife blade. Depending on your level of expertise in knife sharpening and your pocketbook, you will need to choose what kind of stone you wish to use. Stones have a coarse and fine side to them which you can usually determine by feel. All stones will sharpen, but some will sharpen faster than others. The stone method takes the longest amount of time to do and is recommended to do once or twice a year. Whetstones: These are the least expensive, easiest stones to use. They often form grooves where the blade runs down the stone which can eventually affect how the blade is sharpened. Ceramic stones: Harder than whetstones, they will sharpen faster but can be more difficult to use. They also hold up longer than most whetstones and don’t tend to warp as easily. 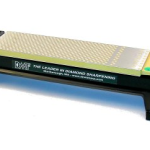 Diamond stones: These come in various grades and are the most expensive and hardest type of stone to use but also the fastest way to sharpen blades. Step 1: Choose the stone you wish to use. If you are using a whetstone or ceramic stone, you will need to soak them first. If you are unsure how long to soak a stone, check with the manufacturer or ask a local expert. Soaking can require anywhere from 10-15 minutes for some whetstones or as little as 3-5 minutes for a ceramic stone. Step 2: Lubricate the surface of the stone liberally so the knife will glide across it and heat from the friction will be reduced, thus reducing warped spots. Use special sharpening oil or regular machine oil for whetstones and ceramic ones. Thinned out liquid dish washing soap will work for diamond stones. Step 3: Prepare your knife. Clean off its surface and free it from any debris. Next, check the bevel. This is the angle, you wish to maintain on your knife’s edge. The bevel will vary by knife and can range between 10-30 degrees depending upon the knife’s make and purpose. 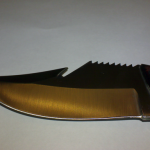 Check with your local knife dealer or knife manufacturer for recommendations if you are uncertain. When sharpening your knife you will need to keep the angle constant, so if you are new to this task you may also wish to purchase a sharpening guide that attaches to your blade to keep it at a steady angle during the process. Be aware that guides may not work well with curved blades. Step 4: Place your knife at the appropriate angle on the end of the coarse side of the stone and using long, sweeping motions, pass it along the stone from end to end. With practice, you will get into a rhythm and find yourself making long circular motions as you continue to sweep the blade along, completing at least twelve passes on one side before turning the blade over to repeat on the other. If your blade is curved or longer than your stone, remember to not only sweep horizontally but vertically along the stone to ensure sharpening all parts of the blade. Step 5: Flip your stone over to the fine grit side and repeat the process for each side of the knife. The finer side of the stone will help get rid of any bumps, called burs, or rough spots from debris that may have formed on the edge during sharpening. Step 6: Test your knife for sharpness. The paper test is quick and easy. Hold up a piece of paper with one hand and see if your knife will slice through it easily. If it’s really sharp, it should slide right through. This method is also known as “honing” and requires the use of a steel rod. It’s probably the most familiar method that comes to people’s minds when they think of knife sharpening as it recalls visions of fathers standing at the head of the table and sharpening the knife before carving into the roast turkey at Thanksgiving. Steel honing rods can cost hundreds of dollars but you can find a reliable, inexpensive one for as little as $20.00 online or at your local hardware store. The steel method is a faster process that the stone method and can be used for “tune ups” to keep your pocket knife ready at the sharp. Step 1: Identify the end of your rod that has the guard Grab it with your non-dominant hand. Make sure to place your fingers well behind the guard. Hold the rod up at a 45 degree in front of you away from your body. Step 2: Wield the knife in your dominant hand, and place the blade’s heel against the base of the honing rod. Now draw the blade up the rod away from your body using a slow, flowing stroke. Turn the blade over and pull it back down the rod in the same way to sharpen the other side. Alternate this cycle five or six times for each side of the blade. 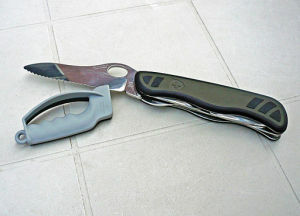 With these two cutting edge techniques, you can always be assured of having a sharp pocket knife. The stone method will work to restore seriously dull blades while the steel method can revive worn out edges. The results of each ensure a safer pocket knife that saves you time and effort.